Thanks for noticing. I am indeed trying this again. "Hello there! This is Total Drama Island!" declared a female Meowstic with blatantly fake enthusiasm. "We've invited several Pokemon here to spend the next few weeks here at Camp Psyche, named for yours truly. They'll be battling each other in all sorts of challenges until the sole survivor receives the luxurious one million dollar grand prize!" Psyche momentarily glanced off screen. "Honestly, is one million really necessary? ...Fine." "Our campers-to-be will be under 24/7 surveillance, no matter where they are. Every few days, they'll have a challenge, which they'll compete in as part of a team-at first, at least. The winners of each challenge will be immune to that evening's Campfire Ceremony, where the losers will be voting off one of their own to board the Warlord of Shame and lose their chance at the prize for good." The psychic paused expectantly. "They should be here now." Let's help with that casting issue. This roleplay is based on the uncommon Total Drama Island RP, which in turn draws its concept from the Canadian animated series of the same name, which in turn is a spoof of sorts of Survivor, which is an elimination-style competition. As mentioned above, participants will compete in teams for the first half of the RP, and the losing team will vote to eliminate one of their members. It's fairly simple concept, but it's one that I hope I can run better than I did last time (read: I intend to not just arbitrarily let this die). 1. All Pokemon Showdown, PSRP, and Roleplaying Forum rules apply. 2. Create as many characters as you like, but be aware that they must all be decently developed ones and you must RP them all. (Note: By developed, I only mean that their personality is an actual one and not something along the lines of "nice/funny/mean to those they don't like". They don't have to have been used in another RP.) If someone creates an astronomically high number of characters proportionally, then they may be required to not use some of them. 3. These rules are subject to change. 4. All characters must be Pokemon, and only Pokemon. No gijinkas, no humans, no angels or demons or anything else you come up with. 5. You can make alliances with each other within the RP. You do not need to PM these to the host, as it should be obvious that you are making one. In-universe, realize that your character is not always hiding in the bushes in the right place at the right time. 6. During the elimination period, all eligible voters must PM their votes to the host. They must have a valid reason for casting this vote ("I'm not fond of this RPer" is not a valid reason). 7. Characters whose species are comprised of more than one sentience (ex. Dodrio, Doublade, Magneton, Zewilous, count as one character, but each sentience may have a distinct personality. 8. The host will only create a character if the number of total participants is a number not divisible by two or three. 9. Enjoy the roleplay. Really, I hope you do. Oh, you want to join. There's no need to reserve a spot, since you could currently in theory make unlimited characters. This post will contain a summary of things that have happened both in and out of the RP. Jan 9, 2016: This RP came into the world. Personality: Well, I guess you could say Cryppy's personality is cryptic. One moment he's pulling pranks, the next he's attempting to swoon a lady, and the next he's sleeping in his ponytail. His personality is mostly comprised of cunning and crafty. He can be what people need at the right time, but after a bit of knowing him, people would understand the trickster side of him is the real side. Biography: Cryppy grew up without a fath- lolno. 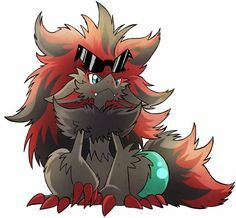 The Zoroark lives off of whatever he can live off of. He just does whatever. To be honest, his background is completely cryptic. Fears: Cryppy has a giant fear of Ursarings... especially those named Milo. Traumatic moments have happened. He also has a small fear of people who are emotionless when he talks to them... and whales. Likes: Cryppy loves Monster and graffiti. He also enjoys people failing. It brings out his mocking and maniacal laugh. Dislikes: Cryppy hates idiots. Idiots don't understand his trickiness, so they get boring. That leads it to the next dislike... boredom. Cryppy hates whatever boring. Other: Enemies should watch out... but more so allies. Personality: Vanity is Chic's middle name... along with stylish, adorable, cute, beautiful, amazing, talented, and...wait... who edited my notes? Erm, anyway, Chic most certainly lives up to her name on the outside, but on the inside lies a rotten core... wrapped in a bright pink bow, of course. Chic is without a doubt 100% full of herself and self-centered. She only cares about herself and her potential well-being. Don't be fooled by her "selfless" as they're nothing more but power play attempts to be used for leverage later. Being indebted to Chic is the worst than death. Her infiltrative words of persuasion and her seductive eye laced with a killer glare practically force you to pay up if you haven't already submitted yourselves. Chic is a stuck-up, pretentious, spoiled young lady who is ruthless in achieving what she wants. But, most wouldn't see this ridonculous side of hers unless she let her guard down because to the public eye, Chic is the nicest, brightest, and generally-well liked person out there. Chic's charisma doubles her social charm and she most certainly knows it. Biography: Chic was born into a rich family, the only daughter of a prominent businessman and a beautiful socialite. Naturally, her unnoticeable beauty was to be exploited by her mother for nothing more than bragging rights. Chic, however, hasn't complained yet, as her mother's personal interests paved the way for her future career. From a young age, Chic, as a Buneary, partook in beauty pageants, showcases, and eventually contests. She had reached a stalemate in actual winnings, coming to find out that the "cuteness" factor was "out-of-style" and that Chic was "too-old to be cute". Chic tooks these words to heart and left the performance scene. While on this break, Chic started to drift away from her mother and floated over to her father. Frequenting on business trips with him, Chic studied fashion and beauty under many teachers and professors all over the world. She also picked up a interest in battling and gained a small reputation among the local fighters of the areas she visited. It wasn't until Chic discovered her mother's old contest pictures that Chic realized what "true beauty" was. Change. The following year, Chic took the fashion industry by storm with her new and improved look. The "too-old for cute" Buneary they knew had evolved into the "hip, stylish, this-just-in" Lopunny. Modeling, acting, singing, and performing were just a few of the jobs Chic juggled. When she heard of a reality tv competition starring teens, Chic thought it was the perfect handle to promote her brand name, "Too Chic", to a large audience. Thus, her father pulled some strings and got her an audition. Fears: Bugs, Ugliness, Slime, and public humiliation. "Like, gross." Likes: Muscles, Luxurious Things (Namebrand), Softness, Flirting, Fashion, Battling, and Money. "Like, duh." Dislikes: Chic hates dirt, germs, fatness (whether people or food), cheapness, diets, loud and obnoxious people, snoring, waking up early/disturbing beauty sleep, cold food, sweating, and staying up late. "Like, ew". Personality: An odd personality but not a bland one at least. 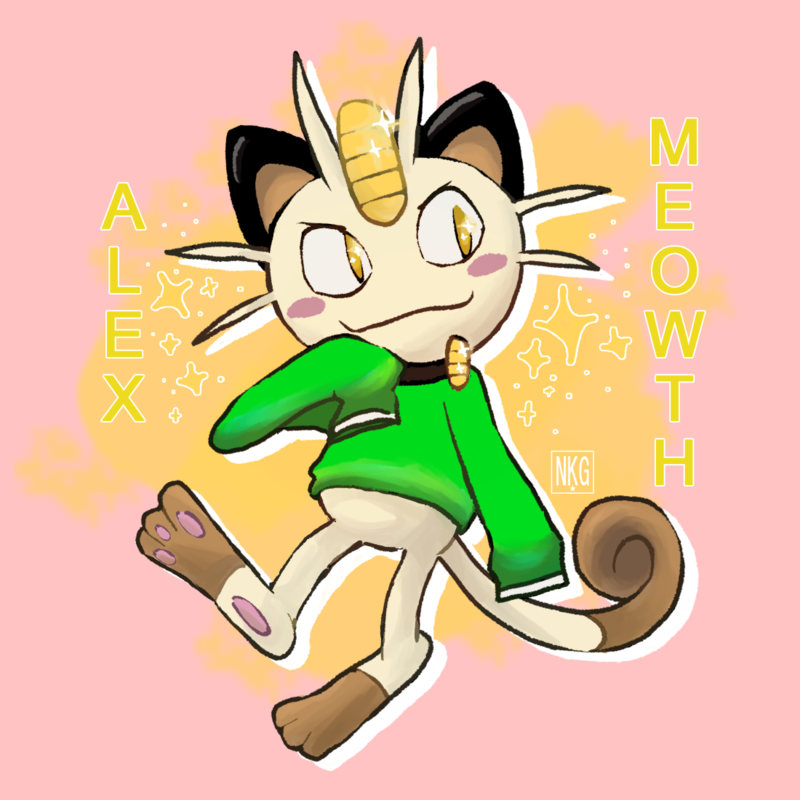 Anyways, Alex is a rather arrogant Meowth, complimenting himself frequently as well as talking about how good he is at everything as well. This is quite ironic due to his low self esteem and usually when he fails something more than once, he will fall into a depressed like state. Once you get past the arrogance he will come off to you as a rather friendly pokemon, his point of view from more of a common pokemon's view and he does indeed believe in justice. He is not afraid to speak his mind and will usually dive head first into danger, though when things get very tough or threatening he will become fairly cowardly. He can be somewhat smooth and often comes out as a flirty character, though this is usually accidentally and not on purpose. He also prefers things in a more organized and clean way. He will not hesitate to clean something that's dirty and ruining his house. He is awful with death and relationships and awaits further character development. Other: Well, now that I think about it Alex is still in the works. He will likely be made more interesting later when I get to it. I started roleplaying more than a year ago so now that I can actually roleplay in paragraphs I think I can make him better. It just may be harder to fit some stuff in last minute. Only time will tell. Also, Alex is sometimes seen wearing a green sweater. Species: Zoroark with a habit of appearing to look like his good friends. Personality: Hal is a trickster by heart, and, not originally being from the pokemon universe, chose to take the form of a zoroark, reflecting his nature easily. Having gone through rigorous training at a young age, when the time arises, he can dedicate himself to a challenge fervently. Although, most of the time, he is willing to enjoy life, and hang out, and make new friends (Sometimes hoping for something more…). He decided that this ‘TDI’ experience would be a good ‘character building’ time, and that the people he meet here might not be the scum of the earth. Despite this, he’s rather competitive, and would do… almost anything to win. At first impression, he comes off as rude and arrogant, and does so for a bit after you meet him. But to those he deems worthy of his trust, he eases up, and becomes a lot more friendly. Other: Hal is a trained fighter, especially in the use of brass-knuckle related combat, focusing on power rather than skill. He also has ‘minor proficiencies’ (as D&D put it)in shortsword skills. Hal’s story is incomplete, and as such, is open to be changed (because time-travel is a thing he has encountered before…). Also, wears a Focus sash as a scarf, and black glasses. Impetuously friendly, she's known from her friends for being a bit of an impulsive prat. Only ever so slightly insensitive, she tends to walk into situations without a care in the world. Terrible at sensing tension, she's positively awful and wonderful. Surprisingly careful. Quick to adapt to new environments, seeing everything in a positive light. Living in a nomadic sort of family, constantly moving from place to place, she was always amazed by the brilliant contrast between the wastelands and the cities of light. She had hatched on a fateful spring day, and evolved rather rapidly, to her mother's despair ("A teenager! So soon? I wanted to baby her some more!"). Ever since then, her mother had shoved her away from any potentially shiny rocks, hoping to keep her young and not have her flutter off into the flock like all the others. Except for the fact that she had managed to enter herself in the contest ("How? We don't even have a mailing address!"). To say the least, she had been accepted. Somehow. She's rather scared of bugs, for some strange reason. Not the Pokemon, but things like small little ants and the such. The unknown. Exploration. Food. Flying. Things like that, she's still a normal teenager though she evolved so rapidly. Strange rocks("That rock looked like an apple, and it bit my teeth!" "You don't have teeth." "Shush!"). Particularly fond of Pecha Berries ("Delicious no matter how you ruin the-- I mean, cook them."). I declare the RP OPEN! All of the OCs that have been created so far are accepted! Since the forums tend to not have as many people online as PS, I'll aim to begin this when there are 10-15 characters. I'll add everyone to the list of contestants, which will be updated into teams when there are enough characters to begin. 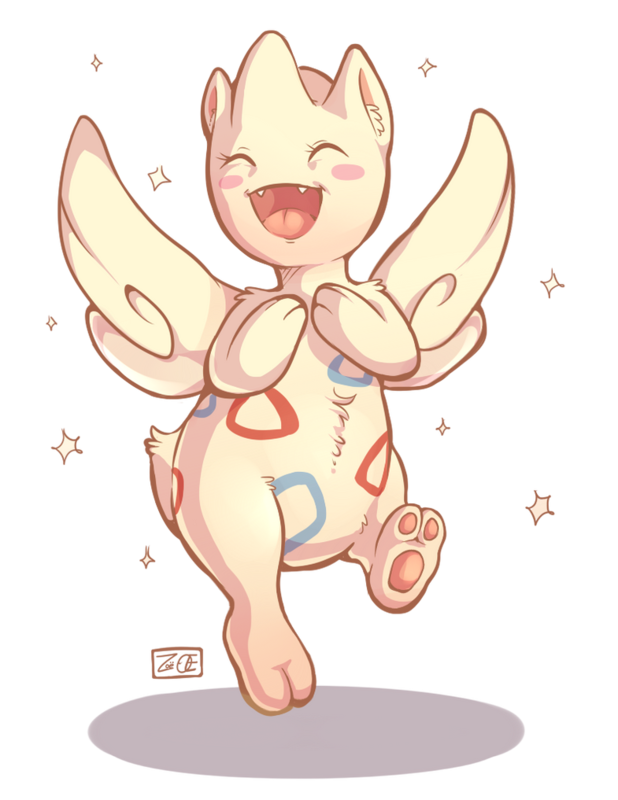 Togetic isn't a Normal-type anymore, Penny. You have been accepted and added to the list.